Jesus is the true vine and the disciples are the branches. 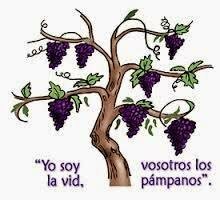 "I am the true vine and my Father is the husbandman." The word for "true" in this verse is "alethinos" which means "genuine". Now, one thing can be true, compared to error and falsehood. Or one thing may be true, compared to that which is a forgery, which is the sense in which it was used here. We have already seen this word used in the same way, previously in the Gospel of John. John was a reflecting light, but Jesus Christ was the true Light. So too, Moses gave bread in the desert, but Jesus Christ was the true Bread. Therefore, Jesus was saying, "I am the genuine vine." These disciples thought according to their Jewish mentality, and their mental schemes had been influenced by the Old Testament. Jesus was telling them that the nation of Israel was not the true vine. His identification with the Jewish nation and with the Jewish religion was not essential. "I am the genuine vine," He said. The important thing was that the disciples were related to Jesus Christ. Our Lord used a marvelous figure of language here, and he expressed clearly that identification with a religion, ceremony, or organization was not the most important thing. You dear listener, you have to be identified with Christ himself! You are united to Christ through the action of the Holy Spirit, in the moment you trust Christ as your personal Savior and are reborn as a child of God. "My Father - said the Lord - is the husbandman". This, too, was a statement of the utmost importance. In the passages of the Old Testament and in the parables, God was the owner of the vine. Here, God is the husbandman, who takes care of the vineyard. Jesus is the true vine and the Father cares for Him. In the Old Testament we were told that the Lord Jesus, "shall come up as a branch before him, and as the root of a dry land." Think of how many times the Father intervened to save Jesus from the devil, who wanted to kill him. 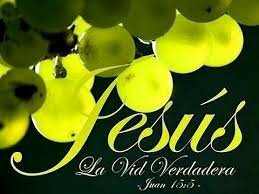 The Father is the one who took care of the Vine, and will also take care of the branches or branches. The branches or small branches, have to be attached to the vine. For what? To bear fruit. Congratulations @amis24vi! You received a personal award!